While visiting my brother and his wife, I saw this teapot up on their hutch. 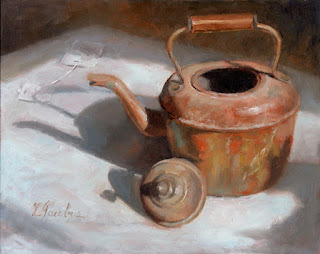 I placed it on the table, the sun was shinning on it from the window and the teapot was vibrant with all its patina. It was a painting within itself. Patina is brought on from aging, patina says I have been around a long time and I have a story to tell.